A local hack historian called it a 400 square-foot architectural gem. DJ’s Seafood and Wings, Cooked Fresh, Call-In Orders Welcome, however, is painted pale lavender, signage in sloppy red letters, and surrounded by a chain-link fence. Its fresh paint manages to look faded on this faded street, situated on its concrete island in Tallulah Avenue at North Pearl Street, a few blocks south of North Shore Park on the Trout River. A local hack historian called it a 400 square-foot architectural gem. St. Johns Flower Market stands on its concrete island at St. Johns Avenue and Herschel Street, between Big Fishweir Creek and the finely aged brick Fishweir Elementary School. Its yellow paint and dark green trim corroborate the green stems and white hydrangea and yellow rose and red delphiniums you can buy inside. The wall nearest the intersection extends into a green trellis covered in dark green vines. The 400 square-foot architectural gem on Ricker Road near 103rd Street waits empty and without its roof, full of things growing wildly: dog fennel and morning glory. The Skinner family ran a vast dairy farm off Bowden Road on the Southside. By the late 1950s, grocery stories were no longer mostly small neighborhood family-run businesses, and the expansion of large corporate grocery chains made it harder for independent dairies to compete. Disappearing were the days of home delivery of milk bottles that, once used, you would rinse and place back outside for the milkman to pick up before the next delivery. The Skinners’ solution was to build a series of small drive-through dairy stores called “milk houses” in neighborhoods across Jacksonville. The “milk houses” had a base area of 416 feet and offered milk, ice cream, sherbet, eggs, and other dairy products, in addition to beer and cigarettes. 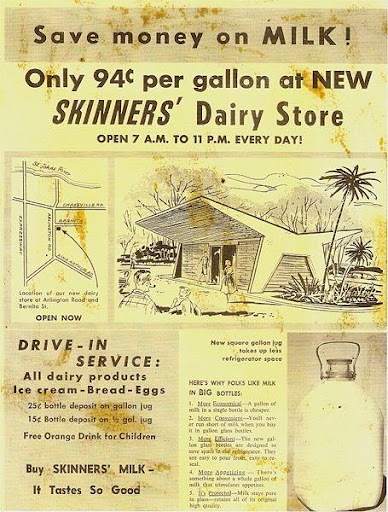 The first Skinners’ Dairy opened in 1958. The former Skinners’ “milk house” on Ricker Road near 103rd Street stands empty and without a roof, full of things growing wildly: dog fennel and morning glory. The little girl loved to ride up to the Ricker Road Skinners’ with her daddy, because she associated the bird building with the coming eating of strawberry ice cream. She called it the bird building because of its size and its shape. Skinners’ Milk Houses were designed by the architect Taylor Hardwick, who also designed such 1960s-era iconic structures as the Haydon Burns Public Library at Adams and Ocean Streets downtown and the Friendship Fountain and Park at the Southbank Riverwalk. These 400 square-foot dairy buildings were designed by one of the city’s most iconic architects. No wonder she called the dairy on Ricker Road the bird building. On the night of a play or concert or the annual Nutcracker across the street at Fishweir Elementary, the neighborhood arts magnet elementary school, the pavement outside the flower shop is lined with parents waiting to buy roses and daisies. The two canopies occupy more total area than the shop itself. These canopies, at 286 feet each, are the building’s wings. The wings rise up at either side from the main roof, creating the buildings’ iconic “butterfly roof.” Each side of the building is largely glass, originally sliding glass doors, novelties when the dairies were built, that accommodated dairy drive-through lanes in the new era of never leaving your car, the newly self-defining everyman possession. A metal door rolls down across the glass side doors at night. Forget the fact that the car determined the structure of the building, like a motel, or motor hotel, or motor court. Forget the car and remember the building. Its simple beauty was that of a small thing, an eyeball or a bird, in proportion to a greater wingspan. The bird building was small, elegant, not quite a Karmann Ghia but more than a Volkswagen Beetle, something like a hummingbird as a building, modest and lovely as a buckeye butterfly with its wings of 1960s hippie-Victorian wallpaper. Well, maybe that, or maybe not all that. Maybe a roofless building on Ricker Road, or a Riverside Avondale flower shop, or DJ’s Wings and Seafood on Tallulah Avenue. Henry Cordes Skinner died Sunday at a nursing home. He was the last surviving of three brothers who ran Skinners’ Dairy for several decades before it was sold in 1984. He was 94 years old. Save money on MILK! Only 94¢ per gallon at NEW SKINNERS’ Dairy Store OPEN 7 A.M. to 11 P.M. EVERY DAY! Location of our new dairy store at Arlington Road and Bernita St. OPEN NOW DRIVE-IN SERVICE: All dairy products Ice cream – Bread – Eggs 25¢ bottle deposit on gallon jug 15¢ bottle deposit on ½ gal. jug Free Orange Drink for Children Buy SKINNERS’ MILK—It Tastes So Good New square gallon jug takes up less refrigerator space HERE’S WHY FOLKS LIKE MILK IN BIG BOTTLES: 1. More Economical—A gallon of milk in a single jug is cheaper. 2. More Convenient—You’ll never run short of milk when you buy it in gallon glass bottles. 3. More Efficient—The new gallon glass bottles are designed to save space in the refrigerator. They are easy to pour from, easy to reseal. 4. More Appetizing—There’s something about a whole gallon of milk that stimulates appetites. 5. It’s Protected—Milk stays pure in glass—retains all of its original high quality. In 1980, a little boy stays in the little yellow house on Randolph Street with his grandmother Ola. The little yellow house is not much bigger than a Skinners’ Dairy “milk house.” In the little yellow house is an old refrigerator, a 1950s model, and crates of Royal Crown cola in bottles. Also, there is a room that’s always closed in this two-bedroom house. He never sees inside it while she lives. In this room, everything is red, a red settee, a red armchair, a red-grained RCA Victor Victrola. Everything is old in the little yellow house. His grandmother is old too. She sits on the sofa with her Bible open on her lap, with her 1950s pocketbook and her 1950s couture. She sits attentively, encouraging her grandson. He stands before her, six years old, with his Bible open to Genesis or John, preaching a sermon to his grandmother. She sits attentively, her chin raised, her legs crossed, very proper. On one shelf is a bronzed-over shoe that he had himself worn in 1974, before he was one year old. And before the shoe was bronzed. The boy and his frail grandmother walk down tiny Randolph Street. Years later, the street will seem barely bigger than the little house. But in 1980, the walk is a journey, and somewhere along the way is a footbridge that, years later, had been obviously only a few feet long, stretched over a creek that was really a ditch. But in 1980, the footbridge over the creek is a monument in the landscape. The boy and his frail grandmother walk up Alpha Street and cross Cassatt Avenue to Skinners’ Dairy, where Ola buys a half-gallon of milk every other day, and then they return to the little yellow house. Small walk is a great event. Small details are large when the vast self is much smaller and less aware of greater surroundings, though more aware of small details, when the tall man is still a little boy and the big world is the little yellow house on Randolph Street, the footbridge over the creek, and a half-gallon of milk at Skinners’ Dairy on Cassatt Avenue. The footbridge remains, but all the coordinates it connected have changed. One “bunch” of yellow daisies is $5.95. Marianne Thiesen says they opened the flower market 18 years ago, but every now and then someone still steps in and thinks it’s a Skinners’ Dairy and asks if they sell beer. They sell no beer, but offer red-stalked bromeliads, red-flowering kalanchoes, and sharp green mother-in-law’s tongues. Or you can buy a large arrangement of Jade Green Roses for $85.00. In April, they offer the loveliest selection of spring daffodils in the city.